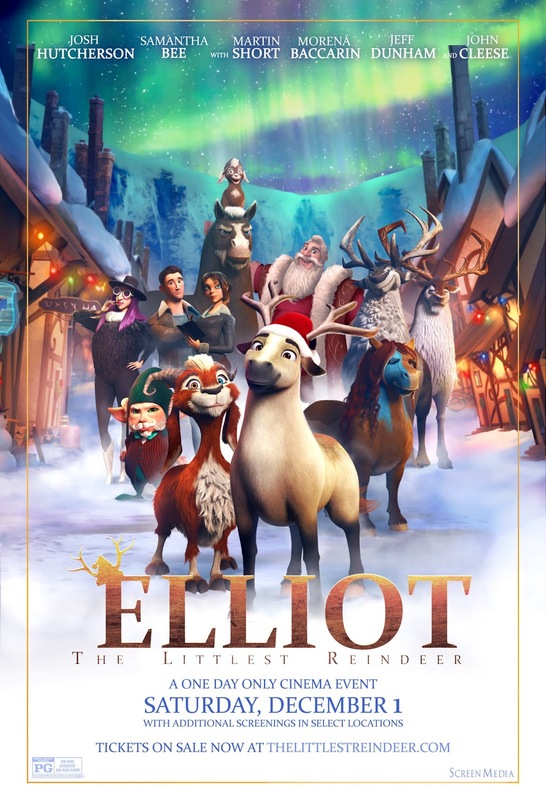 ELLIOT THE LITTLEST REINDEER is the sort of film that most people are not going to look at. An animated Christmas film from a small studio is the sort of thing that most people are going to overlook. Sure the kids might be interested, but since it isn’t from the giant Hollywood hype machines it can’t be any good right? Wrong. Elliot is a charming little gem of a film that a year, when it is finally discovered by the majority of the world, is going to on its way to being hailed as a classic. Yes it is that good. I say that as one of the few people who saw A CHISTMAS STORY when it opened in October in an empty theater and had to beg and plead for people to go see it. They finally did when Thanksgiving came and a year later when it hit home video. Consider this me begging and pleading. The crux of the film has Elliot a miniature horse living at the North Pole wanting to help pull Santa’s sled. Try-outs are coming but, he is believed to be too small…an a bit of a helpful screw-up. Of course complications arise and with the help of his friend, a wisecracking goat he might just have a shot. That the film works as well as it does it due entirely to the script. Writer /director Jennifer Westcott has crafted a wonderful and heartwarming tale. It’s a story that makes sense. The plot while following an expecte path isn’t all cliché, we want to watch because we really want to see how Elliot makes out. Best of all it has extremely well drawn characters. These aren’t types but people with the result that we really care. The writing is such that it gives actors like Martin Short and Samantha Bee something to work with. There is enough here that the performance is something they care about and isn’t tossed off as if it was a paycheck job. I put Elliot on begrudgingly, it was animated and I try to review any animated films I get and I instantly fell in love. Half way into the film I was calling my brother telling him that my niece had to see the film. Avery is a smart little kid and doesn’t fall lock step into just any kids film. She hates Frozen and loves Studio Ghibli (which she discovered without my help) and based on conversations with her about her tastes this is the sort of thing she will eat up. Actually this is the sort of all kids (even the big ones) will love. It’s a wonderful feel good story. Its warm and witty and just great fun. Elliot is one of my great discoveries of the year. It is highly recommended when it hits select theaters on Friday and screening in special one day only screenings on Saturday.